One of my favourite parts of travel is eating. A home cured bacon kit! We started it yesterday, and I haven’t tried the bacon yet, but it looks amazing. It’s pretty easy so far- you put the included Prague salt in with a pound of salt and a pound of sugar and then dredge 0.9kg of pork belly in it. It sits for a week, then you infuse it with liquid smoke. The amount of the base cure- the salt/sugar mix- that you get out of this is actually hella impressive. We have enough to make many a slab of bacon. We made this one plain without additives and we’re using the liquid smoke, then we’re going to make another additive free one in the smoker. 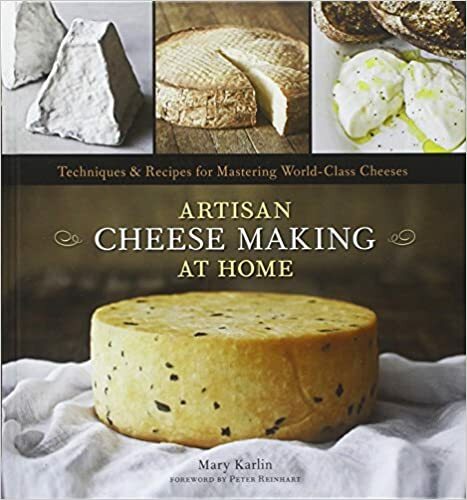 After we compare that, we’ll get fancy with recipes from one of the books I got him…..
Artisan Cheesemaking at Home. I’m not going to lie, I really don’t think we’ll be able to pull of the level of beauty in this book. I mean, there’s burrata recipes in here. BURRATA! If you’ve never had it, it’s literally a ball of mozzarella hiding a delicious, creamy centre. Also, it might be the most delicious thing in the world. The biggest problem is that one ball costs $16 at Whole Foods. I first encountered it while working in Taranto. My host family took me to this restaurant that was literally just all about mozarella. There were knots of it, balls of it… anything imaginable. But the star was burrata. I’ll keep you updated on my experiments. Speaking of experiments…. I also got him a 4 Cheese Making Kit! Honestly, I think if you don’t know what to get someone, get them a cheesemaking kit. I’m going to start with a quarter review of this- it makes ricotta, paneer, chevre, and cream cheese. Since it was Adam’s birthday, we had a bunch of people over. We created a simple menu. We wanted to keep it delicious, easy and cheap since we had 9 people. Homemade pasta with a simple marinara, garlic bread, and homemade ricotta. We started with the sauce. 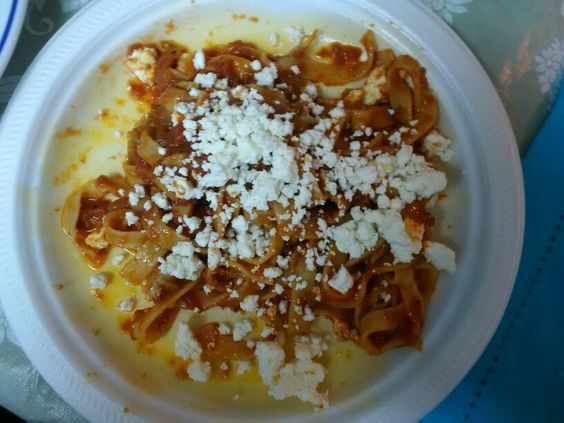 I didn’t want a super fancy sauce because I wanted to really focus on the ricotta as the special area. 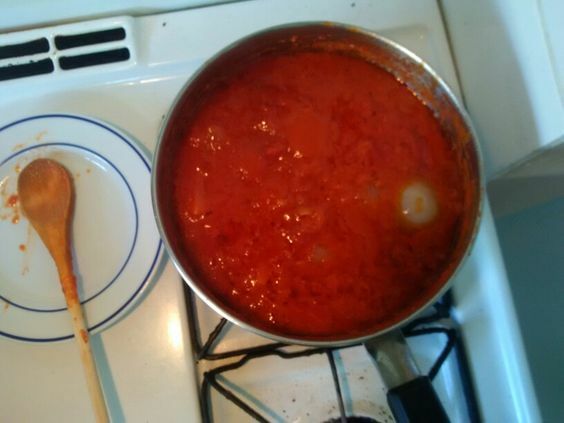 So, I put in a stick of butter, 2 cans of tomatoes, and a quartered onion. I used one can of crushed tomato and one can of diced. There’s really no reason for it either, it’s just what I had. All the big bits broke down pretty well, so I think it’d even work with whole tomatoes. This is it bubbling away after a few hours. It’s seriously as easy as bringing it to a boil and letting it simmer. I added a little salt and pepper at the end. Then we started on the ricotta. Apparently it’s SO easy to make. You literally just heat the milk…. Then add lemon and strain. Why do we buy this stuff?! 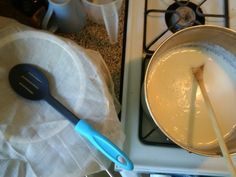 The kit came with cheesecloth, some cultures that I guess are for the cream cheese and chevre, and a cheese mold. Yeah. We made this cheese. Like made it. Making cheese is seriously magical. When the curd separates it just looks… bewildering. I can’t wait to make the rest of this kit. So far, it’s a 10/10 would definitely buy again. 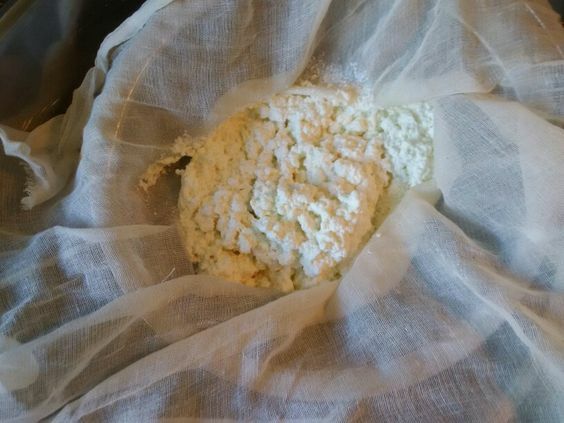 One of the best parts of cheesemaking? Whey. I read somewhere you could cook pasta in it, and man was this stuff amazing. It added a whole layer of flavour too it. I forgot to take a picture of my first plate which would have been better and less pasta on a dirty plate, but man… I totally forgot because I got so into how amazing this pasta was. Now fingers crossed that next time I’ll be making homemade carbonara with some amazing home-cured bacon…. ← Where Do I Sleep That Night? !